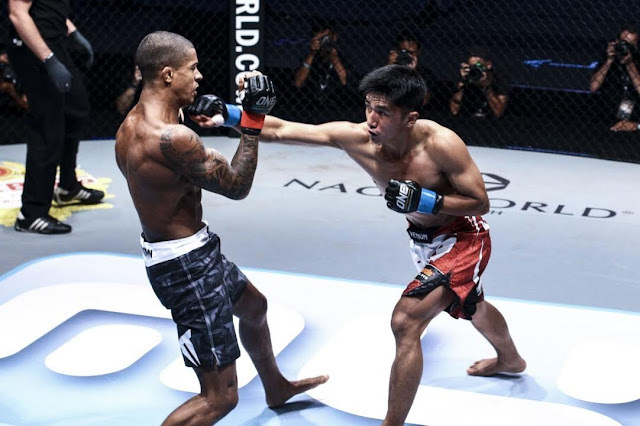 Filipino martial artist Geje Eustaquio has no plans to leave the outcome of his upcoming bout in the hands of the three judges at cageside as he is set to share the ONE Championship cage with fierce Thai rival Anatpong Bunrad. Both men are scheduled to square off against each other on the undercard of ONE: DYNASTY OF HEROES, which takes place at the 12,000-capacity Singapore Indoor Stadium in Singapore on 26 May. Eustaquio and Bunrad first crossed paths in April 2015 at ONE: VALOR OF CHAMPIONS, where the latter took a split decision victory. “The last time we fought, it was a razor-thin decision,” Eustaquio said, looking back on his close decision setback to Bunrad two years ago. The 28-year-old Baguio City native Eustaquio feels that a consistent work rate in the rematch will be vital in his search for redemption against his Thai counterpart. “Maybe I lacked the quantity in striking. There were also cases when his leg kicks, though those were weak ones, did connect. It didn’t hurt as much, but in the eyes of the judges, it had a big impact. So maybe this time, I’ll avoid those leg kicks,” Eustaquio said. Although Eustaquio still believes that he did enough to get the win in the first encounter, the man known as “Gravity” intends to leave no doubts in the second meeting by claiming a decisive finish. “I have to make sure it will be a landslide if it will go to a decision, or if God permits, I will knock him down or submit him. I will go there and do my job. If God permits, I will bring home the victory,” he stated. The last time that Eustaquio scored a finish inside the ONE Championship cage was when he knocked out Malaysian standout Saiful Merican with a counter left hook in the first round in January 2016. With less than two weeks left in training camp, Eustaquio stressed that he is now focusing on the mental aspect of the marquee match-up. “As we wrap up the training camp, we now channel our focus on the mental aspect. Since we fought before, we know how high his energy is. We have to be mentally prepared as well,” he shared. Eustaquio believes that he is the better cage competitor than Bunrad, noting that he has learned his lessons from his last three outings in ONE Championship. “My first fight against him served as a big lesson. It’s my duty to learn from my mistakes and improve to become a better martial artist. I know what I am capable of. I can’t wait to showcase my talent this coming May 26,” he ended.